The Top 40 is facing a shake-up as chart bosses consider incorporating songs from music streaming sites. Offering free, legal access to millions of tunes, online jukebox services like We7 and Spotify have taken off in 2009. 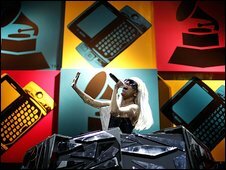 Users can listen to tracks without paying to own them, as they have had to with vinyl, tapes, CDs and downloads. The Official UK Charts Company said it was "bound to" include streaming and subscription services at some point, but not for at least another year. Because listeners do not pay per track - if at all - those plays would be likely to carry less weight than normal sales. That would be a big departure from the way the the official singles chart has been compiled since it was launched in 1952. It has always been based purely on sales, with each individual purchase - whatever the format - treated equally. But the streaming and subscription services may soon become too popular to ignore. Spotify offers streamed songs for free with adverts, or without ads for a £9.99 monthly fee. It registered one million UK users in April - just two months after its public launch. We7, which goes down the free, ad-funded route, is expected to pass the million mark in the coming days. Services like Napster, HMV and Nokia give customers access to unlimited tracks for a monthly fee and Virgin Media has just announced a similar offering, with BSkyB expected to follow suit. 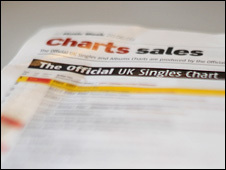 Official Charts Company managing director Martin Talbot told BBC News the charts had traditionally counted individual singles bought for permanent ownership. "The key task that we've been getting to grips with over the past 18 months has been ensuring that post-download, and post-permanent ownership of music, we're also counting how consumers are consuming their music in other ways," he said. "The charts have always been there as a popularity poll, as a means of identifying what are the hottest records of the moment. "That's been relatively simple when people have bought stuff to keep forever. But that's going to become increasingly more complicated." The charts have already come a long way since 2005, when the first downloads counted towards the Top 40. Now, 98% of all single sales are digital. Mr Talbot said streams and subscription downloads would be integrated into the main chart when they become "a very big part of the way people consume music going forward" and fans were buying fewer tracks as a result. "I'm sure it will come upon us quicker than we might anticipate but none of us really know when it will happen," he said. "I think ultimately it's bound to happen. But that could be five years, it could be 10 years, it could be 20 years." There was currently no sign of a slow-down in single sales, Mr Talbot said. Some 115 million singles were sold last year - compared with a low point of 30 million in 2003. This year's total is expected to be 160 million. One big question if streams did count towards the charts would be how much weight they would carry. "Knowing what a stream is worth compared to a purchase of a download, for instance, is very difficult to identify at the moment, but that's obviously going to be the next step," Mr Talbot said. The advent of services like We7, Spotify and Imeem, on top of established sites like YouTube, MySpace and Last.fm, have led some analysts to predict that people may become less interested in owning music. Instead, they may be happy to stream songs from huge catalogues, especially as technology makes it possible to use these services on the go. Will Spotify change the music biz?